Whitbread gave us a challenge to develop a brand and an integrated attraction campaign for a chain of new restaurant – the name of which was embargoed! After trialing a number of sites, our task was to recruit 40 restaurant managers to this new, and at the time, unveiled chain. So, we had to produce a ‘blind’ campaign featuring creative that would intrigue the target audience rather than relying on an established brand presence. To increase the mystery around the campaign, Whitbread didn’t even want its name or corporate branding used in any aspect of the marketing. The new restaurant concept itself was based around the idea of having very different and individual eating areas – of varying sizes and styles in each site. Ultimately, tables will be a key feature of the new brand’s marketing, so this was one concrete fact we could allude to. 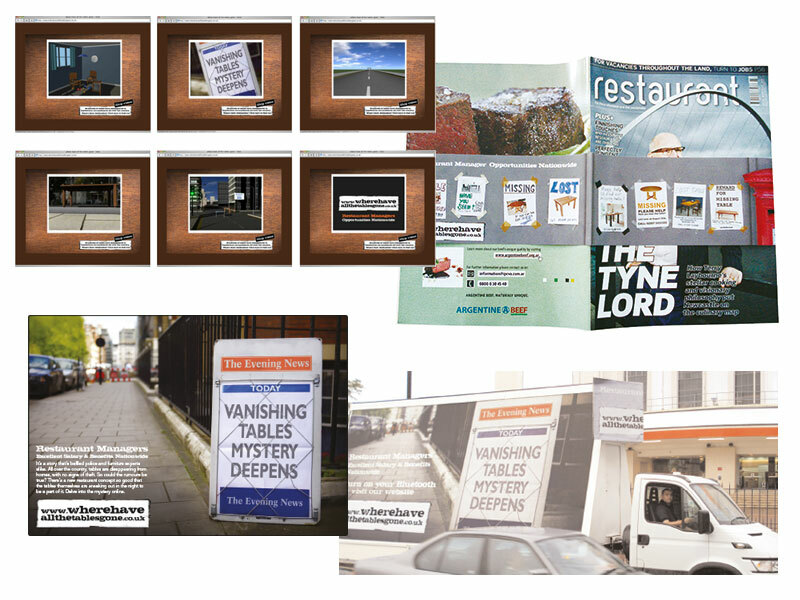 We therefore decided to make tables the stars of the campaign. Our idea envisaged tables coming to life to make their own way to these new Whitbread Restaurants. With no corporate branding in the marketing, we knew such an intriguing idea would arouse lots of interest in our target audience. We also saw the potential to extend the idea across lots of different creative executions in very different media including print and specialist foodie magazines, online collateral as well as SEO all drove traffic to a microsite. We also targeted the Restaurant Show held at Earl’s Court to launch the initiative. The campaign not only won a nomination at the prestigious RADs for the best campaign of the year, it also, more importantly, delivered some very strong traffic to our site with over 6,500 unique visitors and over 400 online applications made in the first month alone. The restaurant chain was launched successfully and still goes strong under the name of Table Table.